If you are looking for a large group of quality dairy goats to start or expand your herd, Poplar Hill Dairy Goat Farm is the place to come to! We are one of the few farms that can fill large orders. We also sell many dairy goats each year for 4-H projects, pets or to supply milk for your family. We have a LARGE selection of registered Alpine, Saanen, Nubian and Toggenburg dairy goat does and bucks for sale. If you have a particular trait you are looking for including price, age, color or production requirement, email us or call us at 651-442-2506 for more information. New - Click dam and sire names to view ADGA genetic and official milk information. 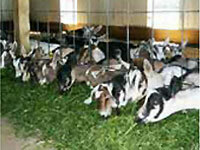 We specialize in selling large groups of dairy goat doe kids but also sell individual animals and small groups. We are almost sold out for 2019. Contact us soon if interested in a dairy goat doe kid. We have many great dairy goat bucks for sale.